There are few things in the world that everyone gets excited about together. One of them is a royal wedding! After Harry and Meghan’s announcement of their engagement, it’s safe to say we were all counting down the days together. Meghan’s down-to-earth style and personality set the stage for our own royal wedding inspiration. From Meghan’s beautiful ensemble to royal standards, we’ve collected the best royal wedding moments that you can incorporate into your wedding day too! 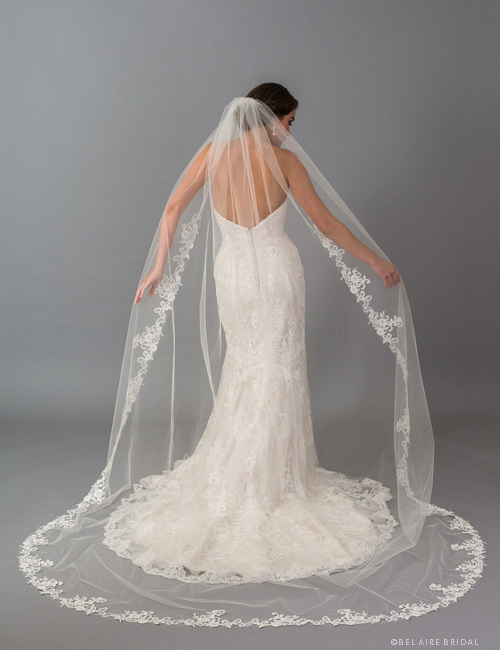 As you can see, simplicity balance with a dramatic veil makes quite a royal statement no matter who you are! 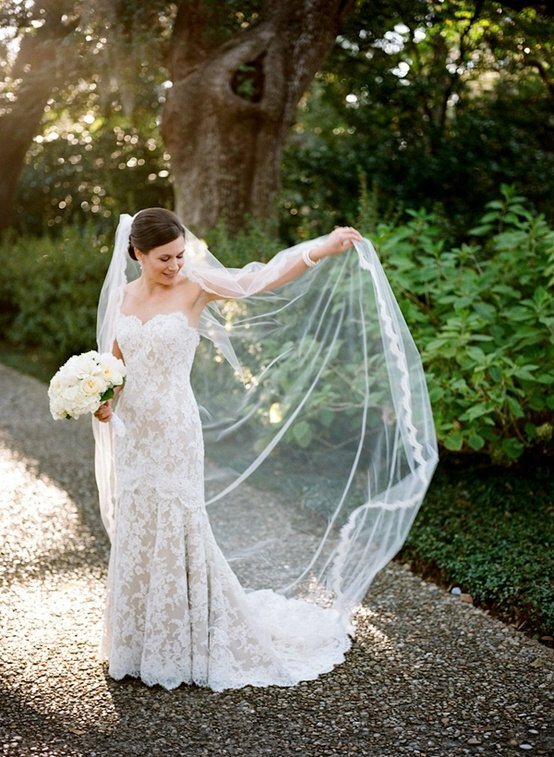 Obviously, you LOVE your wedding dress, but have you thought about a reception dress? Meghan chose to wear a bespoke Stella McCartney as her second for their reception. Having a reception dress allows you to choose a dress that allows more movement as you greet your guests and let loose on the dance floor. It tends to be a more practical option when many wedding dresses are limiting in their movement, making it hard to enjoy your moment! It can also be fun to have two different dresses. Perhaps you want to look all decked out for your ceremony but would prefer something a little simpler. This is a great way to do both! Go crazy and get a ball gown if you desire, and loosen things up with a simpler dress for your reception. We loved the classic and royal appearance of Harry and Meghan’s wedding invites! However, did you notice anything about them? Meghan’s full name is actually “Rachel Meghan Markle.” On the invites, you’ll see it only says, “Ms. Meghan Markle.” Using “Ms.” in front of Meghan’s name indicates she was married before. However, “Ms.” is a current way to avoid using “Miss” or “Mrs.” Although Buckingham Palace is often strict when sticking to the rules, The Duke and Duchess of Sussex had a say too. Dropping “Rachel” indicates how she is recognized by the rest of the world as “Meghan.” If you too are known by your middle or another name, don’t feel obligated listing your formal name. It’s your wedding day after all! We loved how simple Meghan’s bouquet was and adored the floral arrangements for her wedding. 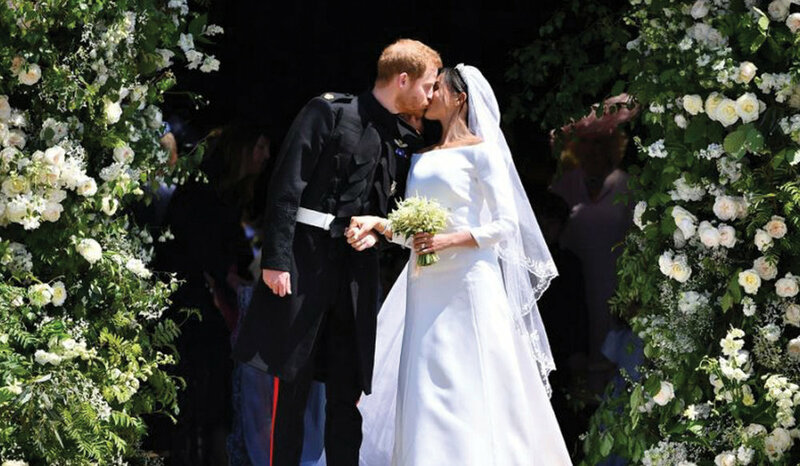 The Duke and Duchess chose Philippa Craddock as their floral designer who took care of all of their floral décor down to Meghan’s bouquet. 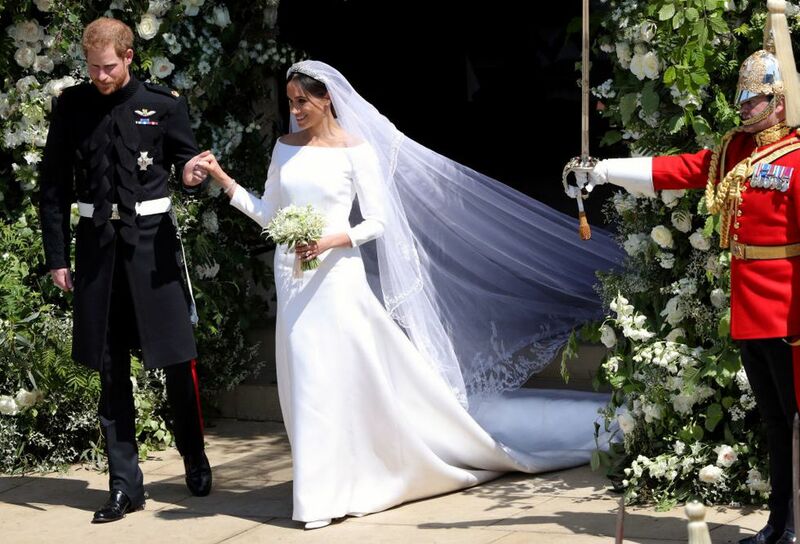 The royal couple chose flowers that had both meaning and symbolism. White garden roses and forget-me-nots were included as a favorite of the late Princess Diana. Craddock also included beech, birch, hornbeam, foxgloves, and peonies, which are Meghan’s favorite! What do you do with all of the flowers after such an extravagant event? They were donated to St. Joseph’s Hospice in London! Both the staff and patients were so happy for this special delivery. If you’re unsure of what to do with all of your floral arrangements, think of donating them to a local business or hospital that would appreciate them just as much! Meghan wore the borrowed headpiece from Queen Elizabeth II (originally Queen Mary’s, the Princess of Teck) to adorn her head for the royal wedding day. It is traditional to wear a family heirloom headpiece for royal weddings. You too can wear a tiara without having to be a royal member! 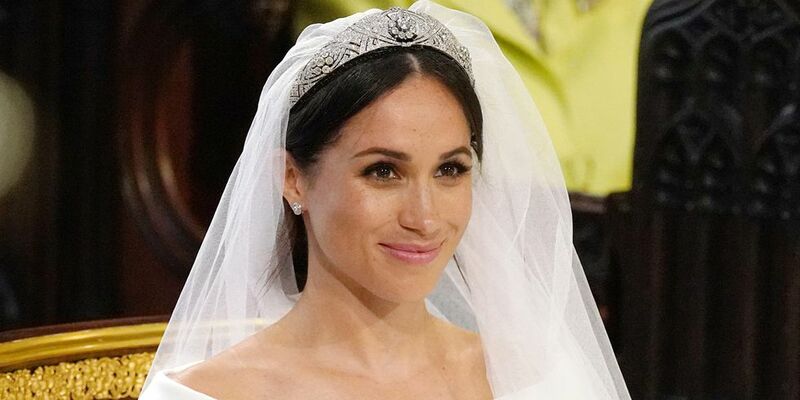 If you’re wearing a simple dress like Meghan, a tiara is a great way to balance it out and make it very formal. Try out different ones to see which tiara looks best on you and fits your style. For Harry and Meghan’s wedding favors, they opted for blue and beige mini tote bags for guests. Each bag included a chocolate gold coin with their initials, bottle of water, magnet, shortbread, and a Middle Ward gift shop 20% off coupon. These items are easily replicable if you’re stumped as to what to include for your guests. You can also include some practical items, such as Advil and Band-Aids, makeup remover, coloring books for kids, and other fun but useful items! We also love that the tote bags were practical and classy; perfect for a royal wedding! Upon arriving, guests turned in their cell phones and photography was banned from the event. Aside from security, technology can be very distracting during weddings. Although your guests are very excited to be there and see you on your big day, all the photo taking, Snapchatting, and social media can get in the way and be distracting for the ceremony and other guests. Have guests disconnect so they can truly be present for your big day. Don’t worry; they’ll see plenty of photos afterward that you’ll share with them! The Duke and Duchess of Sussex had asked guests to donate to seven charities of their choice to honor their wedding day instead. This is a great idea for couples who may not need or want wedding gifts, or would rather do something for the greater good rather than receive gifts themselves. If you have a particular cause or several charities that mean a lot to you, this is a great way for guests to honor you while also helping a good cause. What better way to celebrate your wedding day?! Harry and Meghan had stated on their invitations the dress code for the royal wedding, but just because it was a royal wedding, doesn’t mean you can’t have it too! If your wedding is going to be more on the formal side, you can request certain formal attire be worn for guests who may not be aware of the formality. You don’t have to be strict or picky, which your guests will appreciate, but a dress code can easily help you guests plan ahead for your wedding. As Harry and Meghan exited, they departed in the carriage of their choice: an Ascot Landau. Now, you don’t have to have a carriage to have a royal send-off, but choosing to ride off into the sunset in style is still romantic! Renting an old school car can be fun and photogenic or even a classic limo is still a great idea! If you do go all out with a carriage, make sure it blends well with your wedding and have a backup plan if it rains and isn’t covered. Harry and Megan chose a more simple carriage, which was fitting for their style, yet still elegant. Whether or not you're a royal, you can certainly take inspiration from Harry and Meghan's royal wedding! A touch or two of these royal wedding ideas in your wedding will certainly take it up a whole new level.